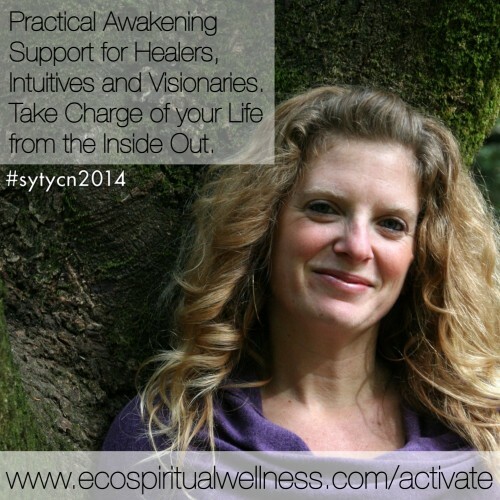 Practical Awakening Support for Healers, Intuitives and Visionaries. Take Charge of your Life from the Inside Out. Right now this is a 5 for me. What’s really clear for me is the “who”: healers. Intuitives and visionaries feels a little less clear. By intuitives do you mean medical intuitives? Or just people who feel like they’re kind of intuitive? Is this different than psychics? And visionaries feels even more nebulous. Do you mean spiritual visionaries? Or big name authors who are helping us re-imagine what society could look like? Or just local people with big ideas? What you’ve articulated is a great example of what I’d call the Big Circle which is the answer to the question, “generally, what kinds of people do I want to work with?” It’s an umbrella label that isn’t that useful in marketing as a target market but is really useful for us a filter and general sense of direction. The term “practical awakening support” is intriguing but not totally clear for me. And the “take charge of your life from the inside out” is a clear sentiment but it’s also used a lot by a lot of people and so it doesn’t help distinguish your particular role in the marketplace. Here’s what it would take for this to be a 10 for me. 1) A clearer sense of who this is for. 2) A keen sense of what the problem is that these people are struggling with that would have them wanting some practical awakening support. 3) A clear sense of the result they’re craving. Are they craving “practical awakening support”? Is that how they would word it? My guess is no. My guess is that this is what you think they need but it’s not what they’d say they’re wanting. My question would be this: if they had all the practical awakening support they needed, what would the impact of that be? What might they want all of that support for? Oh it’s a connection from the spiritual awakening to life … Healers need help too, it’s very hard to see yourself so it’s very necessary and of all people healers know how important it is to receive. 7/10: I love the last line. I can easily conjure up images of what that might look like in my life (similar to my own work). “Practical awakening” isn’t clear to me. What is practical awakening and how might I know I want it? 7/10: My confusion is why healers, intuitive and visionaries need awakening support. My assumption is this group would already have awakened. What specific problem is this group is having that they need to take charge of their life? What part of them still needs to be awakened? 6/10: This is mostly fuzzy for me. It is clear to me that I could be part of your niche. But I don’t get a sense of what it is that you do or how you do it. What makes you different from so many others doing similar work? 6/10: Are you coaching healers? 7/10: Love your direct engagement with the audience through the image you chose. I like the concept, love the acknowledgement that everyone needs help sometimes, but “awakening support” doesn’t do it for me. More something like “keeping on task, or on track or on the path yourself” type of thing. 6/10: Not sure exactly who you are targeting. But I like the idea of it. Wonderful last line though! 6/10: What is “practical awakening support”? Is that a term your industry uses? 5/10 Not sure what you do at all. . . but you get 5 points for putting yourself out there! Thank you! I have redone this a bit. Still working it out. It really is manifesting support for healers. I help people integrate spiritual awakenings with practical living. I am working to reword this. I teach Changemakers a unique manifesting system that is rooted in timeless spiritual principles so you can live your soul purpose.